We thank you for convening today’s debate on the Situation in Afghanistan. It is my pleasure to be here with my accompanying delegation, as the General Assembly adopts its annual resolution on Afghanistan. This occasion is reflective of the international community’s strong consensus on the imperative of ensuring stability and prosperity in my country, and we look forward to the emergence of a peaceful regional environment. This year again, the delegation of Germany demonstrated its excellent leadership of intergovernmental negotiations on the draft resolution that will be adopted later today. We thank the Mission of Germany for its efforts in this regard, and more broadly, my appreciation to all delegations for contributing to the negotiations process. Seventy-one years ago, yesterday, Afghanistan became the 52nd member of this great family - the United Nations. Since the late 1970s, my country has undergone severe trauma after suffering tremendous loses caused by imposed conflicts and the war against terrorism and violent extremism – which is still hurting us. 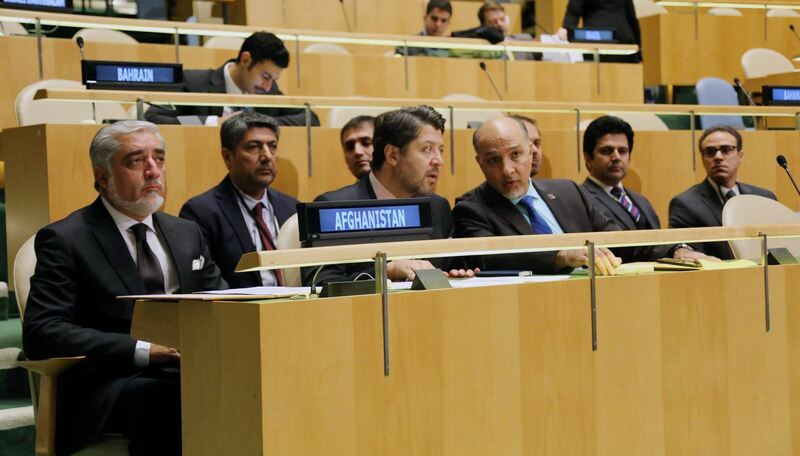 Despite the hardship, today Afghanistan has regained its status as a responsible member of the international community. The unanimous adoption of this year’s resolution signals the overwhelming support of the world behind us, as we continue our quest to achieve lasting peace and prosperity for Afghanistan. My presence here today is a testimony to the importance that the people and Government of Afghanistan attach to this resolution, and more specifically, to its more focused implementation. 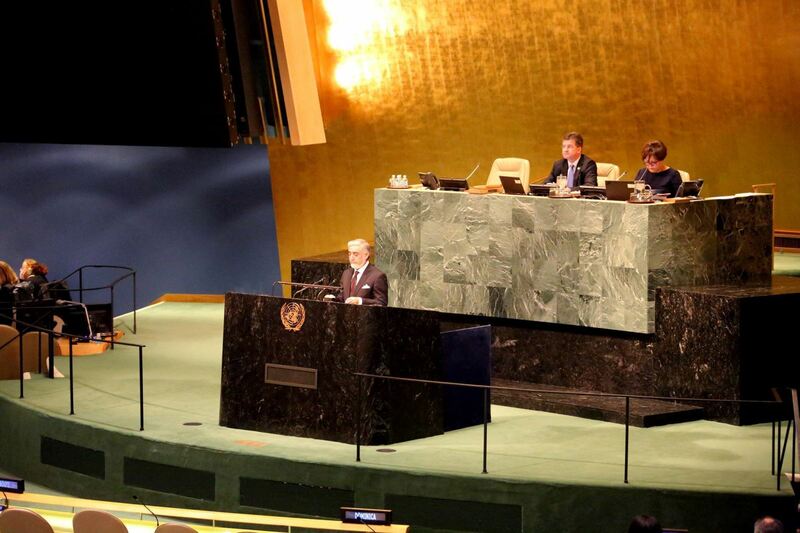 We, therefore, expect and request that member-states view this resolution from a similar perspective. In spite of the challenges that confront us, Afghanistan stands resilient and confident of our stance at home and abroad. 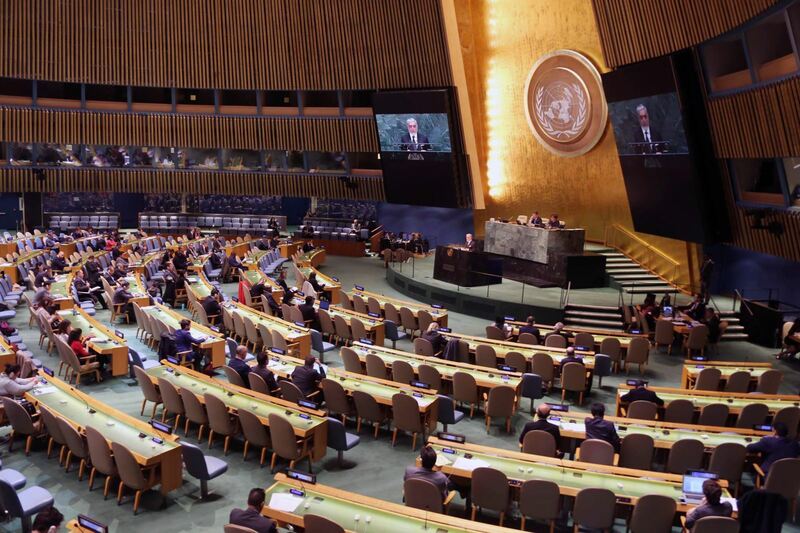 We are a nation firmly committed to the ideals of the UN Charter and the vision of a global landscape pillared on peace, sovereignty, mutual-respect, and cooperation for common benefit. We equally value our bond of partnership with the UN, which has always stood in strong support and solidarity with my nation, especially in the most difficult of times. Today UNAMA and all UN agencies on the ground continue to play an important role in helping us with various aspects of recovery, rebuilding, humanitarian assistances and seeking a peaceful resolution to our political and security needs. We welcome the Secretary General’s UN reform initiative and hope that it will expedite our visualization of a One-UN approach in Afghanistan. Today, we are reciprocating the international community’s generosity by our active engagement and positive contributions. Afghanistan’s recent election to the Human Rights Council for the first time, our membership to ECOSOC, Vice-Presidency of the General Assembly, active involvement in other forums, and the successful adoption of two Afghan-initiated resolutions "Countering the Threat posed by Improvised Explosive Devices" and "International Day of Remembrance of and Tribute to the Victims of Terrorism," attest our national will, our diplomatic efforts, and our eagerness to be an effective global contributor. Let me now provide an update on the situation in Afghanistan. In security, over recent months, our national security forces have effectively thwarted attempts by the Taliban, alongside the affiliated Haqqani network, as well as elements of Al-Qaida, Daesh and other recognized terror groups from making any notable gains, or capturing a major urban center. We are not dealing with one, but several terror outfits that either mirror each other under different labels or indirectly support overlapping agendas. We are grateful to all our international partners for their contributions for equipping and training our security forces, who have courageously and at high cost led the fight against the same international terrorist and violent extremist groups that threaten us, the region and many others beyond our borders. The resolution also reaffirms the importance of the international community’s continued support for Afghan national security forces. To this end, we have adopted new measures, to complement and better coordinate with newly announced strategies by the United States, NATO, the European Union and others, which came at our long-standing request, in the context of sustained international support for security and stability in Afghanistan, whether military or civilian in nature. We firmly believe that a conditions-based approach and clear focus on resolving the problem of regional terrorist sanctuaries and support systems are core issues that will get us closer to peace and stability. They also form the cornerstone of our new National Security Strategy to defeat terrorism, work with nations that share our threat perception, and protect our people against politicized violence. We have long asserted that we seek friendly relations with all nations. We have used every opportunity to make it clear through words and deeds that we will never allow our relations with any single country or group of countries to overshadow or adversely affect relations with other countries in the region or beyond. Afghanistan is to be seen as a strategic asset and a platform of cordiality for all. We consider negative state rivalries and the use of violent proxy forces as counter-productive. There is no good or bad terrorist or violent extremist. We need to agree to fight all forms and shades of terror. We can and should no longer harbor or support one group while fight another and claim to be fighting terrorism in all its dimensions. This year’s resolution also recognizes the centrality of Afghanistan’s role in leading peace efforts, within the framework of the Kabul Process to supplement initiatives for action-oriented cooperation. These efforts will also be guided by the Afghanistan High Peace Council’s New Strategic Plan, centered on a “whole of society approach” in promoting peace. At the regional level, fostering stable and constructive relations with all our neighbors, especially Pakistan, remains a key component of our peace strategy. President Ashraf Ghani and I hope that this time around, action against all forms of terrorism will speak louder than words. It should be noted that changing the status quo can only be possible when terror subsides, infringements on our territory comes to a halt and safe havens are shut down. Failure to do so will have negative consequences and result in further tension or worse. Through the Afghanistan National Peace and Development Framework, we have taken concrete and systemic measures to implement a reform agenda, offer better governance and aim for more self-reliance. Our economy, hurt by the 2014 end-of-combat mission of international forces, which relied on a large-scale military expenditure, has turned the corner and is giving signs of recovery, especially in private sector investment and development. Since the formation of the Government of National Unity, domestic revenue has seen important gains, which, in turn, have helped us shoulder more responsibility for our security and development needs. Moreover, we are making steady progress in the development of our national infrastructure – including roads, industry, energy, telecommunication and transport networks. Once completed, these projects will improve connectivity and generate economic growth in Afghanistan and our region. Once an ambitious vision, the regional economic cooperation agenda is transforming into reality. Afghanistan is becoming a hub for regional and inter-regional trade, transit and transport. Energy transfer is a major component now and into the future. I am pleased to highlight the successful outcome of the 7th Regional Economic Cooperation Conference on Afghanistan (RECCA) held in Ashgabat, Turkmenistan last week, where Afghanistan, regional countries, and other international stakeholders recommitted to the full implementation of at-least eighteen major regional projects. These include the CASA 1000 and TAPI energy and natural gas initiatives, as well as the Chabahar transport and transit project. The recent historic signing of the Lapis Lazuli route agreement between Afghanistan, Turkmenistan, Azerbaijan, Georgia and Turkey marks another important development in the advancement of economic and cultural links in the region. Additionally, the air corridor with India has increased trade volume between our countries, while major railway projects with China, The Islamic Republic of Iran, Kyrgyz Republic, and Tajikistan are also moving forward. All in all, these mega projects hold the promise of propelling a new era of economic prosperity for the wider region. We, in the Government of National Unity, recognize that strengthening good-governance and the rule of law is an imperative for our stability and prosperity. We are making all efforts to fulfill the commitments we made at the London, Warsaw, and Brussels Conferences in 2014 and 2016. The National Strategy for Combating Corruption - a living document - which was adopted in September lays out clear strategies and solutions for systemic reforms across government institutions and agencies. One such example is the public civil administration. The Supreme Court, Attorney General’s Office, and the Anti-Corruption Justice Center, have so far tried over a thousand cases of corruption, bribery and abuse of authority, including senior ranking officials. We have made clear to our people and our international partners that the principle of accountability will not be compromised at any cost. In the area of fiscal sustainability, we have improved our financial systems to the point where it is now declared in conformity with international standards. Our efforts in the areas of the rule of law and governance will continue as a matter of priority. Prevailing insecurity has also led to an increase in drug production in some parts of the country. The dangerous nexus between terrorism and narcotic drugs, therefore, demands a more focused and collective effort from within the region and beyond. 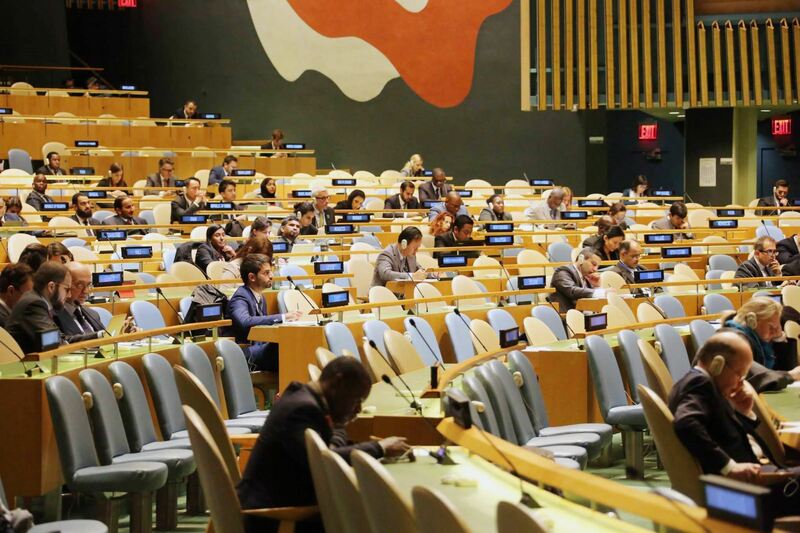 Full participation of women in the sociopolitical processes and economy remains a core priority, in line with UN Security Council Resolution 1325. Today, Afghan women proudly represent our country in all spheres. I would especially like to thank more than 8,500 women who are serving in our security forces. Their contribution and sacrifice is helping us deal with cases of criminality, violence and abuse. Finally, I want to draw your attention to the most important aspect of political stability: learning from the past and assuring free, fair and transparent elections. We are in preparation mode alongside the Independent Election Commission to bring necessary reforms to the electoral process to make sure that public trust and participation is restored to this critical pledge. We are committed to holding parliamentary elections in 2018, followed by presidential elections in 2019. We thank the UN and all other partners for their help in this regard. To conclude, I can say with utmost confidence that the contributions, investments and joint sacrifices made in these past seventeen years have made a huge difference. From a domestic standpoint, the notable gains made across various sectors have had a profound impact in improving the lives of ordinary Afghans across our country. Our civil society is vibrant, our free media is functioning as a check-and-balance system, and our growing youth population is less inclined to leave the country, looking at opportunities and prospects at home. Just two days ago, our under-19 national cricket team won the Asian championship in Malaysia. All in all, we are committed to continuing this journey based on the wishes of the Afghan people, and enjoying the support of the international community. Once again, security being a vital priority for us, and those who are affected by insecurity across our region and beyond, at this important juncture, let us reinvigorate the spirit of international partnership and effective engagement on which the global fight against terrorism began seventeen years ago. Doing so provides the best guarantee for the security and prosperity of all our nations.